Learn more about the campaign at the Alliance for Climate Protection. The Washington Post has paid virtually no attention to Virginia's plans to build a new coal-fired power plant in Wise County. But finally on Sunday, reporter Tim Craig did a lengthy article on the proposal. Craig proved why he's a political reporter for one of the nation's top newspapers. He nailed the politics of the issue, covering the damage Gov. Tim Kaine has suffered for his unwavering support of Dominion Virginia Power and the proposed plant. Well done. But Craig also proved why he's covering politics, not science, absolutely butchering some basic environmental facts. Reading Craig's writing on global warming was like watching William Hung's rendition of She Bangs. Just brutal. "[E]nvironmentalists are opposed to the project, saying that coal-fired plants are a leading cause of airborne pollution, which has been linked to global climate change." The reference to "airborne pollution" was odd enough to be a red flag for me. It's not wrong, it's just an odd phrasing. Most people would just say "air pollution." If someone was writing about movies and referred to them as "moving pictures," it would make you tilt your head a little, no? That sets up the absolutely incoherent statement that aforementioned airbornes "have been linked to global climate change." It's a gross oversimplification to say global warming is caused by air pollution, akin to saying food has been linked to obesity. And what's "linked"? Man-made carbon dioxide emissions cause global warming. Simple. Easy. Say it that way. The plant "would use updated scrubbing technology to limit emissions of carbon dioxide, a big source of acid rain." Carbon dioxide emissions are not a major cause of acid rain. Sulfur dioxide and nitrogen dioxide are two of the prime causes. The plant would not use "scrubbers" at all, which is a specific type of pollution-reduction technology. The plant would use a Circulated Fluidized Bed (CFB) to reduce emissions. Even with the CFB, the plant would still emit 3,300 tons of sulfur dioxide per year, enough to trigger objections from neighboring Pisgah National Forest in North Carolina. Kaine's energy plan "called for a 30 percent reduction in greenhouse gas emissions by 2025." Finally, the article raises an economic paradox - how can you have a reliability and uncertainty at the same time? "The sustainability of our economic development successes are dependent on having a reliable energy source," said Delacey Skinner, the governor's communications director. [C]ompany officials said they cannot yet estimate how much the average bill might go up. So a new coal-fired power plant will be a rock-solid source of juice ... but Dominion Virginia Power can't even give us a guess about how much it will drive up our bills? And this is at a time when the price of coal is reaching new heights. You'd think I'd be pushing the environmental case against this plant the hardest. But it's this economic danger that's actually the most alarming. Virginia is last in the nation in spending on conservation and energy efficiency, but instead of investing in saving energy, we're going to drop at least $1.8 billion on a new coal plant? Instead of investing in clean energy jobs, we're going to pretend to provide economic opportunity by building a power plant that will actually cost Virginia 1,400 jobs? A broken pipe caused sewage to leak into Four Mile Run Stream near Bluemont Junction, affecting waters all the way to the Potomac. All residents are advised not to fish in or have any contact with the waters – including wading or swimming – until further notice. UPDATE: More details in an Arlington County news release. So far in this week's Green Diamonds series, I've looked at the Boston Red Sox, one of baseball's biggest money-makers, and the Washington Nationals, recipients of one of the biggest public subsidies in sports history. Other big-money teams like the New York Yankees and well-financed teams like the Minnesota Twins are kicking off green efforts. But for the final installment of the series, I thought I'd look at the other end of the revenue scale. Can a team that's known for being a cheapskate go green? As the Pittsburgh Pirates are proving with their "Let's Go Bucs, Let's Go Green" program, the answer is yes. The players will have to step up, too. "Players and/or clubbies will have to find the receptacles that say bottles and cans as well," Pirates President Frank Coonelly said after a news conference. Will recycling and using more sustainable materials cost the Pirates more? Sure. But they'll be more than offset by their reduced total paper usage and energy savings. Of course, if you're a Pirates fan, you have only one question: Will some of those savings be put into, y'know, getting better players? Only time will tell. As I covered in Part I of this week's Green Diamonds series, sometimes the greenest building is the one that's already built. Nowhere is that more true than at Boston's Fenway Park. Promoting public transportation. 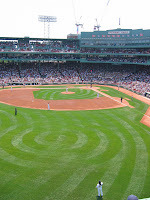 As Alexander Wolff wrote in Sports Illustrated's recent article on green stadiums, "The greenest ballpark in the country may be Fenway Park, because only an idiot would try driving and parking there." Making money. Where else would people pay exorbitant sums to cram into tiny seats that often don't even point towards the field and have obstructed views anyway? But it's a cathedral of baseball that your dad took you to when you were seven and Yaz hit one out. Like the Field of Dreams, you pass over the money without even thinking about it. Whatever approach they take, one thing is certain: Big league sports teams have always obsessed over numbers—stats, attendance figures, salaries, TV ratings—now they’re beginning to run the numbers on carbon footprints, fuel prices, electric meters, and LEED scorecards. Some of the green features have obvious secondary benefits. When the Red Sox renovated the field to include a sand filtration layer that moderates runoff into the city storm drains, they also smoothed the playing surface, upgrading it from one of the worst infields in baseball to one of the best. Reusing bricks as part of reconstruction doesn't just reduce waste, it maintains Fenway's historic feel. The Red Sox will also install solar panels, expand their recycling program to cover bottles, and include more locally-grown and organic produce in its concession stand offerings. And really, no matter what the economic or environmental reasons the Red Sox give, I think we all know the real reason they're going green: Because I sort of bitched about it last year. The Green Miles is a bit groggy today, having woken up at 5:45am to watch the Red Sox beat the A's in the TokyoDome as Major League Baseball opened the 2008 season. As the new season kicks off, I thought I'd take a look at some teams that are reducing their environmental impact without adding significantly to their costs. I'll start right across the river in Washington, DC, where the Nationals are getting ready to open the first LEED-certified ballpark in the majors. As you can see, it's ready for the first home game on Saturday, an exhibition against the Baltimore Orioles. Architects say LEED certification added just $2 million to the stadium's costs, a fraction of one percent of the total. Or in baseball terms, less than the cost of a free agent middle reliever. And some of those costs will be quickly recovered. High-efficiency field lighting uses 21% less energy than standard lighting. What some may see as Nationals Park's design flaw is actually its biggest environmental plus. As these Peeps helpfully demonstrate, it's going to be difficult to drive to Nationals Park and even harder to park there. The vast majority of fans will take public transportation. The 6,317-square-foot green roof over a concession area is planted with about 1,200 drought-resistant sedums. A donation from the Chesapeake Bay Foundation covered the $100,000 cost. The first-of-its-kind wastewater system uses sand filters calibrated to a ballpark's unique needs -- for instance, it's designed to screen out organic debris such as peanut shells and hot-dog bits. The engineers claim that water that has gone through the system is cleaner than the water in the nearby Anacostia River. An in-house recycling center is equipped with four 34-cubic-yard dumpster-compactors, big enough to handle the glass, metal, and plastic recyclables generated during one three-day home stand. For those of us who don't speak horticulturese, sedums basically = hardy shrubs. Of course, the National Trust for Historic Preservation often makes the case that the greenest building is the one that's already built. Would it have been more environmentally-friendly for the Nats to renovate RFK? While The Green Miles is not a scientist and does not even get to play one on TV, I'll say probably. The material and energy it takes to build a new stadium from scratch probably outweighs the negatives of RFK's non-LEED building and massive surface parking lots. But DC wanted to blow half a billion dollars on a new ballfield, so that's that! More details at the Arlington County news release. Readers of this article are left with one glaring question. The Express heavily slices Associated Press content to fit its smaller format. I'm assuming a copy editor quickly cut the article to fit the space, not realizing the cause of the rapid glacial melting had been lost. "There are many canaries emerging in the climate change coal mine," UNEP's executive director Achim Steiner said in a statement. "The glaciers are perhaps among those making the most noise and it is absolutely essential that everyone sits up and takes notice." He urged governments to agree stricter targets for emissions reductions at an international meeting next year in the Danish capital, Copenhagen. It's just one example of how sloppy journalism muddies the waters on the urgent need for climate action. It's a box filled with books, put there by an organization called Books on Wheels. It seems like a great way to promote reading among people who might not have disposable income to use on books. There are plenty of environmental benefits in getting another use out of the paper in the books. Even the box itself looks like it may have been recycled from a previous life as a free magazine dispenser. Well, new to me, anyway. I recently visited Poste in DC's Gallery Place neighborhood on 8th Street NW between the Verizon Center and the Spy Museum. I knew they made great french fries with truffle oil, but I didn't know they carried two varieties of organic beer. Not only that, but they're one of the few places I've ever seen with recycling bins behind the bar. Know of others? Post them in the comments! There's also a great article about green beer options over at the Sierra Club's "The Good Life" blog with details about clean energy initiatives at Sierra Nevada and Brooklyn Brewery, among others. Ask The Green Miles: Can You Recycle Corks? Do you know anywhere in Southeastern VA that recycles cork-Thanks! Generally my reply would go something like this: Don't sweat the small stuff. I'd much rather you spend the time it takes to recycle corks (or other small hard-to-recycle items like yogurt cups) doing something much more effective, like planting trees or telling your member of Congress to support climate action. But thanks to The Green Girlfriend, I have an actual, non-obtuse answer to this question! For Christmas, she got me the Living Green Page-a-Day Calendar. It reveals that Yemm & Hart, a company that finds innovative uses for recycled products, is soliciting wine bottle corks. The corks are being converted into coasters, clipboards, and flooring, with cork contributors eligible for discounts on the finished products. All the details are on the Yemm & Hart website! Got an environmental question? Ask The Green Miles! Bush's EPA Rewrites Clean Air Standards "Based on the Interests of Polluters"
Some presidents would react to news their popularity was at a historic low by trying to do things that were, y'know, popular. Not President Bush. He's apparently decided to take the opposite approach, instead trying to set a new low for popularity that will stand the test of time, much like the consecutive games streak of Cal Ripken, Jr.
With Democrats in control of Congress, the proposal to rewrite the Clean Air Act appears to face long odds. Senate Environment and Public Works Committee Chairman Barbara Boxer (D-Calif.) called the move "outrageous," adding in a statement, "The Bush Administration would have us replace clean air standards driven by science with standards based on the interests of polluters." Here in Virginia, even the new weak Bush standard would mean Richmond, Hampton Roads, Roanoke, and outer DC suburbs Caroline and Stafford Counties will be in violation. Of course, none of this affects us here in Northern Virginia. We haven't met federally required ozone limits for nearly 20 years. And we're adding lanes of highway. Why start now? Dishwasher detergent may make your stemware sparkle, but the phosphates contained in most brands are among the most damaging pollutants in the Chesapeake Bay. Under the new rules, phosphorus will be eliminated from home dishwasher detergents except for a trace level of a half-percent or less. I wasn't aware of the dishwasher detergent-Bay pollution link until this bill came along. I looked for phosphate-free dishwasher detergent at my grocery store, but every brand contained around 8% phosphate. Virginia joins Maryland in banning phosphates from dishwasher detergent effective 2010. It's a small step towards improving the Bay's health, but every step is a good one! 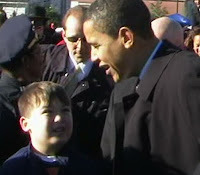 Over at GoGreenMan, Jonathan interviews the presidential candidates and rates them on their environmental views and kindness to children. His two top-rated candidates? John McCain and Barack Obama - one his party's nominee, the other his party's current front runner. If only CNN had analysts with that kind of skill! I was all set to do a post railing against Harris Teeter for carrying a dizzying array of organic food without carrying a single organic option of one of The Green Miles' favorite foods -- ice cream. Not only did they have four different varieties of organic ice cream, but it was very competitively priced -- a quart for $4.99. I thought about getting some for a taste-test, but I'm actually willing to give it The Green Miles Seal of Approval without one. If I'm dropping $4 for a pint of Ben & Jerry's or Haagen-Dazs, I expect it to be excellent. But when it comes to the Big Three flavors (vanilla/chocolate/strawberry), I'm probably just looking for something to a la mode an apple pie. Volume does the trick just fine, and $5 for a quart compares well to Edys, store brands, etc. That's the only organic ice cream available at my local Harris Teeter, but Breyers, Ben & Jerry's, and Stonyfield also make organics. There are also several smaller brands. It's nice to know there are options since dairy is one of the best ways to go organic! On March 9 – Learn how each of us can make a difference to God’s creation. Hear Matthew Sleeth, author of “Serve God, Save the Planet,” preach at Mt. Olivet United Methodist Church in Arlington (his book has a 4.5-star rating on Amazon!). Mt.Olivet is the first church in Arlington to be certified as a "Green Church" in the Arlington district of the Virginia United Methodist Conference. Dr. J. Matthew Sleeth and his family lived in a big house, had two luxury cars, loads of money, and lots of stuff. As chief of the medical staff at a large hospital, Sleeth was living the “American Dream” – until he realized something was terribly wrong. Learn more about his personal and spiritual journey to environmental stewardship. Getting There: Church is located on the corner of 16th St. and N. Glebe Rd. Served by bus from Ballston Metro (even on Sundays). Also an easy walk from the Ballston Metro. Parking lot also available; enter from Glebe Road. They're totally infringing on my imaginary copyright. Doesn't matter if it's imaginary - I'll just instruct my legal team to use The Chewbacca Defense. Works every time. Children in Manchester are being offered the chance to train with a Premiership football club as an incentive to get them walking to school. City council bosses have teamed up with Manchester City in a bid to get 19,000 pupils to make greener journeys by walking, cycling or using public transport. Children will collect 'green miles' - special stickers handed out by teachers - recording how many environmentally friendly trips they have made. The winning class from each school will receive a free training session from the club's City In The Community programme. Councillor Neil Swannick said: "The Green Miles competition encourages children and their parents to consider the impact that transport choices make on their lives and to explore healthier and more enjoyable ways of travelling to school. "Equally important is the very real and positive influence youngsters can have in persuading parents and carers to leave their cars at home." It's enough to turn me into a Man U fan! OK, that's a lie. As a Red Sox fan, The Green Miles could never root for England's version of the Yankees. Thursday, March 6, 7:00 to 9:30 p.m. Hilton Arlington, 950 N. Stafford Street. Join us for exciting green exhibits, the kickoff of the 2008 Green Living Challenge, ACE volunteer recognition and board election, and refreshments provided courtesy of Whole Foods Market. Everyone is welcome. Hosted by Arlington County Board Chair Walter Tejada and featuring keynote speaker Dr. Matthew Wasson, Conservation Director of Appalachian Voices: "Arlington to Appalachia: A virtual tour of the other side of your light switch." To volunteer to help with setup, registration, or cleanup at the Annual Meeting: 703-228-6406 or volunteer@arlingtonenvironment.org. Please take action right now to tell Gov. Kaine it's not too late to change the course of Virginia's future from climate destruction to clean energy.